Nothing says elegant like a French dessert, and nothing says French like crêpes, which is why this Chocolate Dessert Crepes Recipe is the perfect choice for serving a dessert that looks sophisticated and impressive, but is actually quite quick and easy to make. A crêpe is a flat, thin pancake, served either rolled or folded. The origin of the word crêpe is the Latin word crispus, which means curled. Crêpes were developed during the 12th century, in a region of France known as Breton (or Brittany), when residents began grinding down buckwheat and combining it with water and a touch of salt to create a batter. They would then spread the batter onto a hot surface with a wooden scraper until it formed a flat, round shape. Once cooked on both sides, the crêpe would be filled, folded, and ready to eat. Crêpes went on to gain widespread popularity throughout the country (and ultimately the world), and are now known as the national dish of France. They are so popular, in fact, they even have their own holiday: February 2nd is known as the The Day of the Crêpe (le jour des crêpes) in France. It is customary to make crêpes on this day while holding a coin in your hand, and it is believed that if you can successfully flip a crêpe while holding the coin, your family will be prosperous that year. Crêpes can be serviced as either sweet or savory, and both are equally delicious. Popular savory fillings include cheese, ham, bacon, egg, mushrooms, and spinach. Sweet crêpes are commonly filled with berries, sliced fruit, or jam, and topped with powdered sugar or whipped cream. And, one of the most well known sweet preparations is Crêpes Suzette, in which a rolled or folded crêpe is topped with a hot orange sauce, a sprinkling of liqueur, and served flambé style. 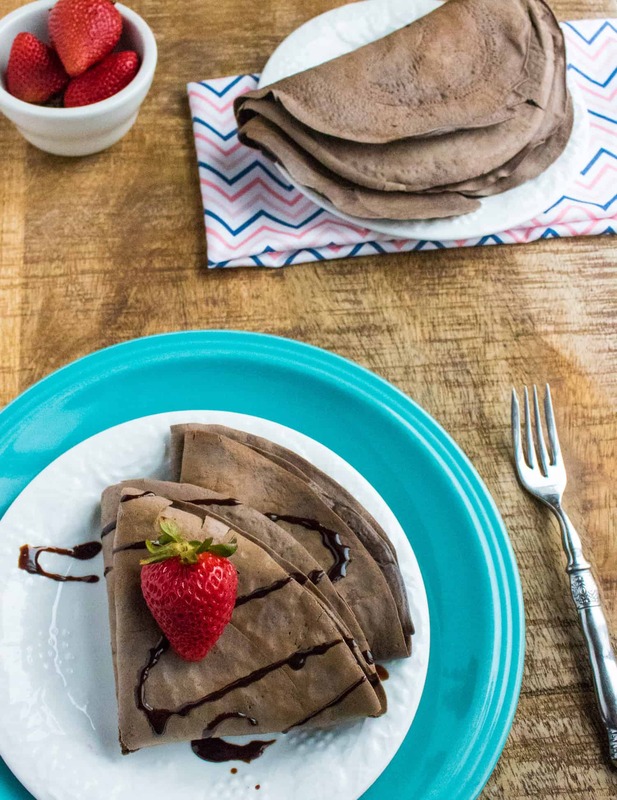 However, rich and decadent Chocolate Dessert Crepes may just be the most popular of all. Make sure your batter is smooth. Thinner is better when it comes to crêpes, and a silky smooth batter makes it easy to pour and spread out in the pan. 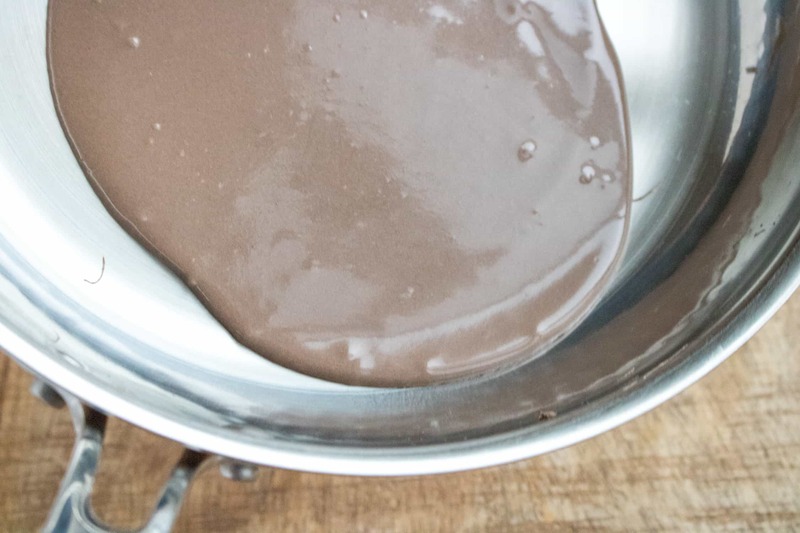 We recommend using a blender to ensure the batter is fully mixed. 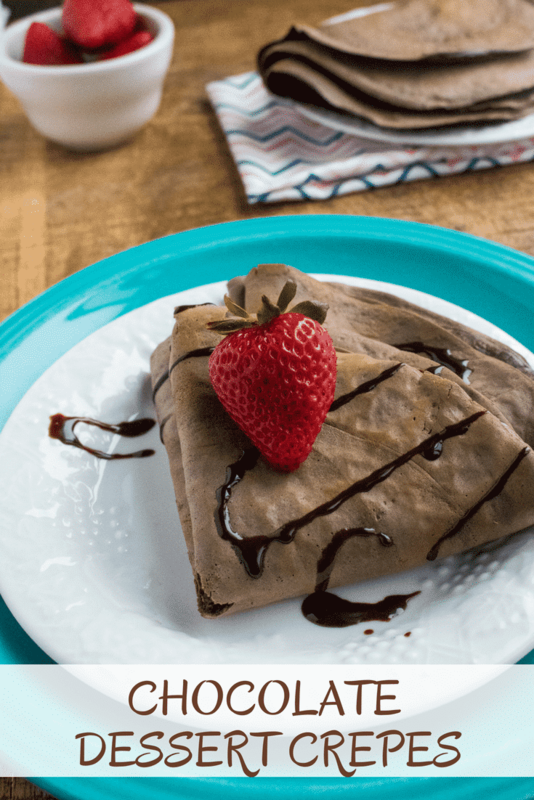 Use the right pan to ensure your crêpes turn out just right, and while any good quality non-stick pan can work, purchasing a crêpe pan can help you easily achieve a successful flip. Don’t flip it too early. Wait until the edges are starting to brown and the surface no longer looks shiny before you try and flip your crêpe. Flipping too early can result in sticking or tearing. 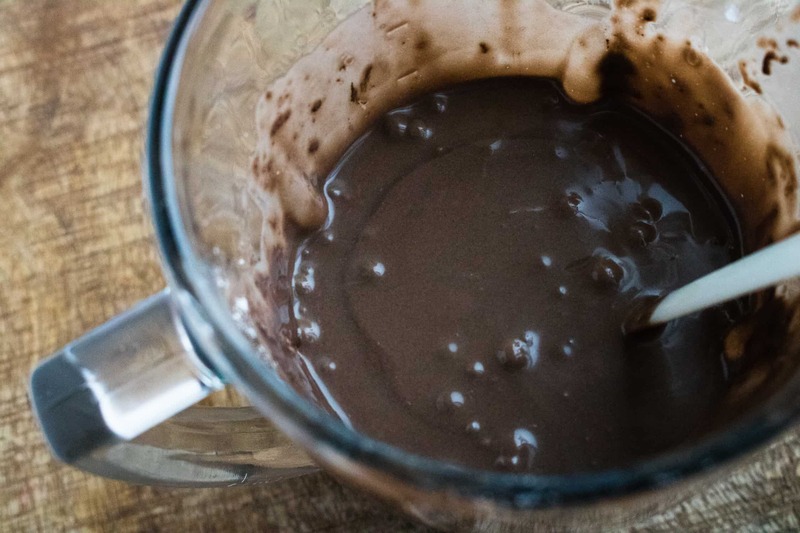 Step #1: Mix the batter (the first 9 ingredients) in a blender. Step #2: Heat a non-stick pan over medium-low on stove and spray with non-stick cooking spray. 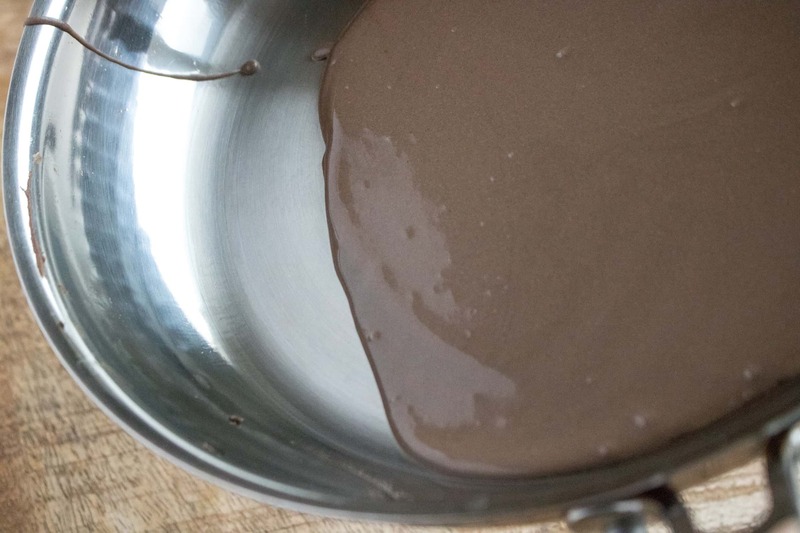 Step #3: Pour batter into pan, about ¾ cup for an 8-inch pan. Pick up pan from the burner and tilt to spread the batter around the bottom of the pan. Moving it in a circular tilting fashion will spread the batter out evenly. Batter should go to the ends of the bottom part of the pan. Step #4: When the top is noticeably cooked, flip the crêpe to lightly brown the other side. Step #5: Repeat process to cook the remaining crêpes, and set finished crêpes on a plate with parchment paper placed between them to prevent sticking. Bon appétit! 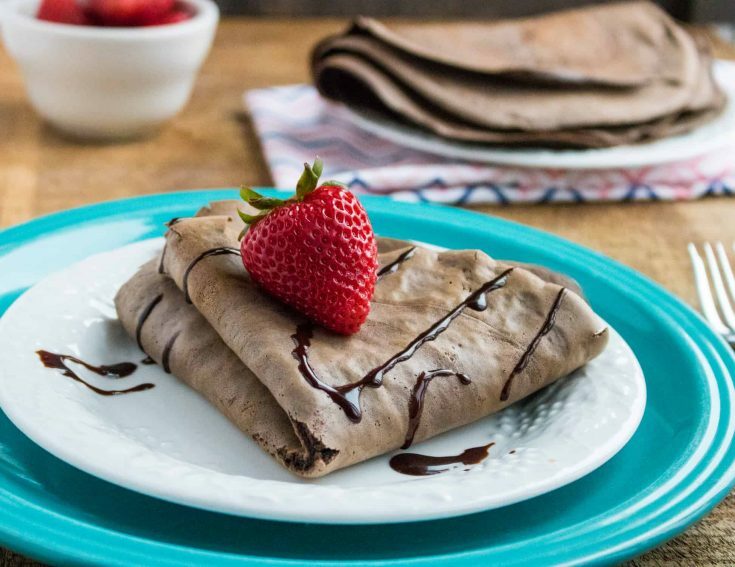 Chocolate Dessert Crepes look sophisticated and impressive, but are actually quick and easy to make! When the top is noticeably cooked, flip the crêpe to lightly brown the other side. Repeat process to cook the remaining crêpes, setting finished crêpes on plate with parchment paper between them to prevent sticking.